The Signs From Ireland ‘signpost picture’ is a picture of an old Irish signpost with the places that mean the most to you, your family, friends and loved ones. And uniquely, each sign shows the exact number of miles to all those important places, just like a real signpost. You can create a Personalised Picture with the places that mean the most to you and you can chooose to have it framed in a black timber frame. Signs From Ireland have also created a series of Irish Landmark posters, with famous historical, geographical, film and tourist related landmarks. 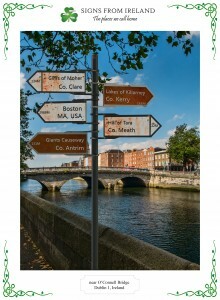 Perfect for a gift or to remember the places you visited while in Ireland.